The towns of Irlam and Cadishead adjoin each other at the western edge of the Borough of Salford in Greater Manchester; before the reorganisations of 1974 thius was part of the County of Lancashire. 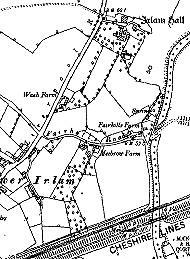 Cadishead, Lower Irlam and Higher Irlam were small hamlets, on the old road from Manchester to Warrington, surrounded by Chat Moss, an area of peat bog. Early in the nineteenth century land reclamation took place, followed in the 1870s by the construction of the Cheshire Lines Railway from Manchester to Liverpool and in the 1890s by the creation the Manchester Ship Canal on the same axis. 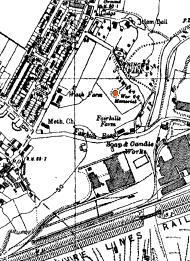 The 1894 map shows the railway, and Irlam Hall, seat of the de Irlam family in mediaeval times, which was purchased by industrialist George Thomas in 1891. He donated land in the grounds south of the hall for the creation of Prince's Park, said to have been named for the Prince of Wales who visited in 1909. The new transport links and consequent development of industry, notably a large steel works and the Co-operative Society's soap and candle works and margarine works, led to the building of homes for the workers. The 1930s map shows that industrial development has filled in the southern part of the old river course. (The red dot locates the War Memorial.) The Hall still existed at that time, having been left to the Council by George Thomas on his death in 1927; It was demolished in 1952. Today, smaller-scale industries and a large Tesco store occupy the area to the south of the park; a number of new buildings have appeared since the 1990s map above. 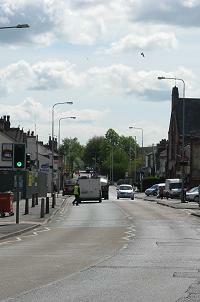 Commuting to Manchester and other centres is also common among residents. 'A chance visit by a BT worker to a scrapyard has led to a town being reunited with a war memorial which went missing decades ago. The bronze plaque, which honours Salford soldiers who died in the Second World War, was found 40 miles away in Wakefield, West Yorkshire. As so often, the story spread across the Internet, enhanced comments made by disgusted readers, and so on, and as elaborated in various ways. It is true that such plaques have been stolen recently from memorials in other places, but not in this case. The Police in Wakefield appear to have become involved, despite many protests by Pete Thomas, co-author of the book on the memorial, that the story was misguided. The 'missing' plaque came from the War Memorial, but was never stolen from there. 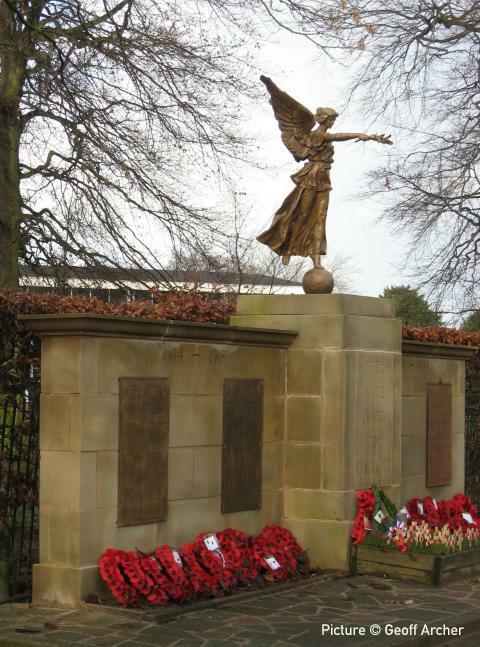 It was replaced, some time around the 1980s, by contractors working for the local Council at the request of the family of Corporal Frederick Noel Heywood, the first World War II casualty from Irlam. He was killed in action during the retreat to Dunkirk in May 1940 but some reason his name was missed off the original plaque. Presumably it was sold for scrap, and found its way to the scrapyard. It was reported that by April 2012, following the publicity, it had been returned and was in Salford Local History Library. The moral of the story is, as so often, don't always believe what you read on the Web. Irlam Railway station, opened in 1873, stands on the Manchester - Liverpool route via Warrington Central. A new section of line was built in the 1890s to climb to a high bridge over the Manchester Ship Canal. The current station platforms are on the opposite site of the 1873 station building from the original ones. 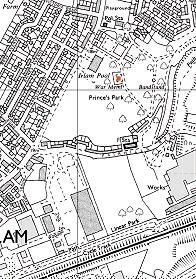 Prince's Park is about 20 minutes walk from the station. If travelling from Manchester, pass under the railway bridge (unfortunately no disabled access) and along the main road. Frequent buses towards Manchester connect Irlam with Eccles, where the bus station is a short walk from Eccles memorial with its identical Cassidy figure. 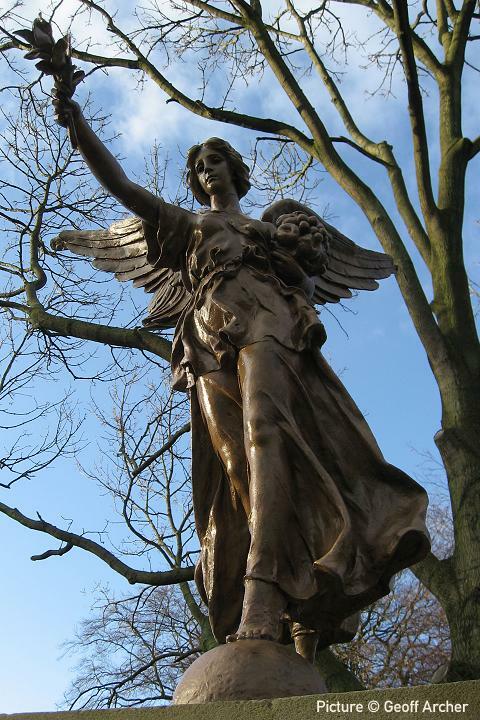 Cassidy's 'Winged Victory' bronze figure on the Irlam and Cadishead War Memorial is a late entry to our collection. It was not included on any of the lists supplied to us by Cassidy scholars and was kindly drawn to our attention by Geoff Archer, author of a comprehensive book on War memorial sculpture, The Glorious Dead1 who also supplied some of the pictures on this page. Researching the memorial led us to a remarkable book: A District at War by Neil Drum and Pete Thomas.2 This 623-page work tells the story of the memorial, and the authors have attempted, with much success, to track down the stories and pictures of all the men from the Irlam and Cadishead area who were involved in the First World War - 1,089 men in total - including 209 who died in the conflict, many of whom are listed on the memorial. 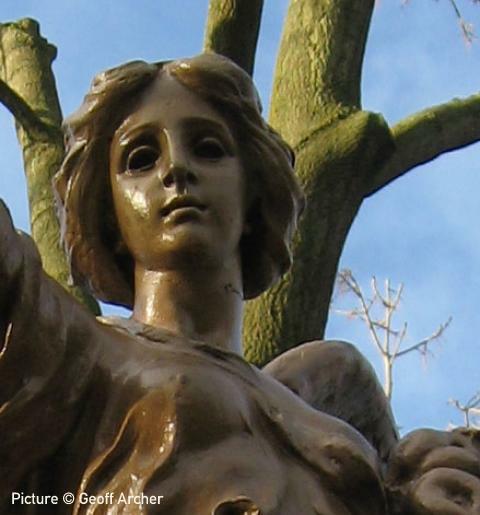 The memorial, which was unveiled in 1923 and stands in Prince's Park, off Liverpool Road near the centre of Irlam, has a rather unusual history. It owes its existence very largely to the leadership of George Thomas JP. Thomas, who had bought the ancient mansion Irlam Hall, owner of an engieering business and a great benefactor to the area had already donated land from the grounds of the Hall for the creation of Prince's Park. He gave £100 in 1921 to start a collection for the cost of the memorial, and contributions from others increased this to £600. Mr Thomas personally commissioned Cassidy to provide the bronze figure. 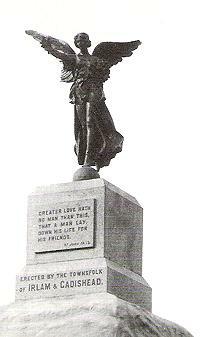 The monument was unveiled by Thomas on 7 April 1923, and on the same day he ceremonially opened Prince's Park. 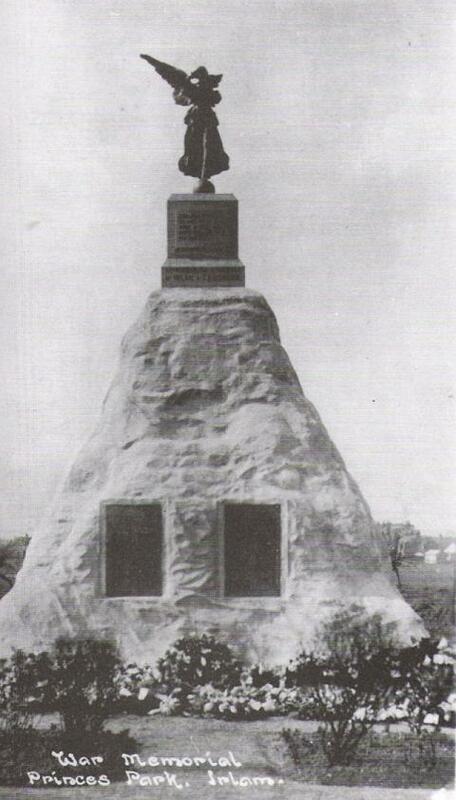 As built, the memorial had a most unusual appearance, as the picture above shows. Cassidy's bronze figure mounted on its granine plinth plinth was mounded on top of a large 'rock of ages' - reportedly made from slag donated by the local steel-making company. Two bronze plaques listed the names of fallen soldiers and sailors from the area. The bronze figure is not signed, but certainly is cast from Cassidy's design as it is identical to the one at the nearby town of Eccles, and the one at Skipton, and at Eccles. All are based on a protoype featuring a soldier and the winged figure which was installed at Clayton-le-Moors in 1920, although the figure is not quite the same. 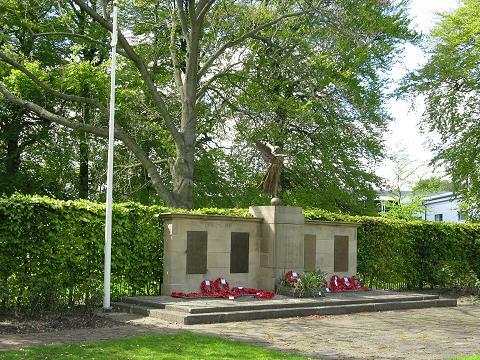 The memorial at Stourbridge (1923) also features a winged figure, but in a very different pose. After World War II, with the need to commemorate the fallen from that conflict, there was no obvious place on the memorial for further plaques. It was decided that since the rock structure was in poor condition, and children were putting themselves in danger by climbing on it, it would be removed and a new memorial of more conventional design created, re-using the plaques and the Cassidy figure. The new memorial, which was unveiled on 5 November 1949 and still stands today, was the work of Irlam and Cadishead Urban District Council. It was designed by the former surveyor to the Council, Mr H. Nurse, and the work was supervised by Edwin Shaw, Surveyor to the Council. 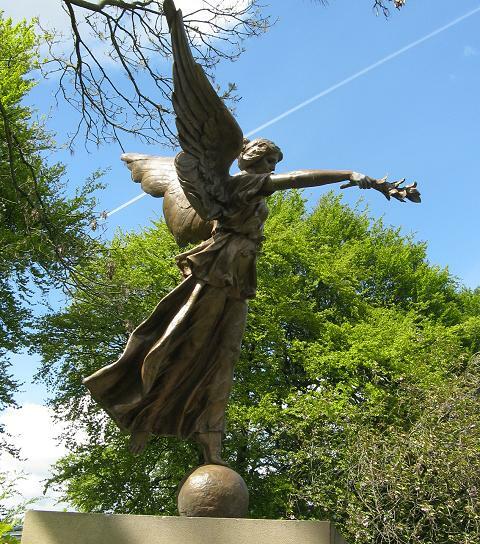 In recent years the memorial has been refurbished, and Cassidy's figure re-patinated; it now shines as good as new. The relatively low height of this memorial facilitates a study of the details of the figure which are hard to see at Eccles and Skipton. 2. Neil Drum and Pete Thomas, A District at War: Irlam and Cadishead's Part in the Great War 1914 - 1918. Thomas-Drum Publications, 2010. The pictures of the old photographs and other quotes about it are from this marvellous source. Written by Charlie Hulme, June 2012.